Disenchantment with the euro had been growing in Italy for many years. After the last elections, this disenchantment proved to be the basis for the formation of a coalition between the far-right wing Lega and the diffuse Movimento Cinque Stelle (Five Stars Movement). While the two parties differed on many economic and social issues, they agreed on that the Eurozone is dysfunctional for Italy. And they nominated a politically experienced economist and a well-known critic of the euro zone, Paolo Savona, as a Minister of Finance. The prospect of a euro-critical government in Italy produced nervousness among other euro zone governments and banks and increased interest rates for Italian bonds. 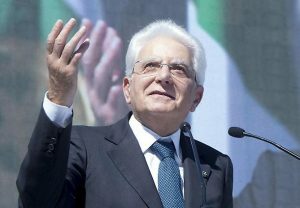 The liberal, euro zone-affine political establishment put its hopes onto the Italian state president, Sergio Mattarella. He did not show reservations against the racist stance of Lega, but singled out a veto against the Finance Minister. He argued that he could not accept a candidate that is hostile to the euro zone. With that decision, Mattarella has moved on politically shaky grounds. It is totally legitimate that a government with a parliamentary majority choses its own economic policy. The Italian president who has its political origins in the centre-left puts this right of an elected government into question. He went even further. After Lega and Movimento Cinque Stelle returned the mandate to form the government, Mattarella designated Carlo Cottarelli as the new Prime Minister to form a technocratic government. Cottarelli is a high-profile liberal technocrat. He held high positions in the International Monetary Fund and was in 2013/2014 a special Commissioner for the Revision of Public Expenditure in charge of budgetary austerity in Italy. Thus, he represents what large sections of the Italian population resent: endless austerity and neo-liberal reforms. Mattarella’s decisions have led to a political crisis. Lega and Movimento Cinque Stelle regard Mattarella’s move as anti-democratic. Among, the major parties only the formerly centre left Partito Democratico, which has adopted many anti-labour measures in its last term of office, defended Mattarella’s move. Independent left commentators, Marco Travaglio, editor in chief of “Il fatto quotidiano”, criticized the State President’s decision. He thinks that Mattarello’s decision turns the coming elections into a referendum on the euro and the President. The general mood seems to be highly hostile to Mattarella’s attempt to prevent a euro-critical coalition from governing. He is seen as acting in line with the banking community and the EU core countries. The euro zone and the core countries, particularly Germany, are increasingly perceived as a problem for the economic development in Italy. Euro zone membership has meant two lost decades for economic development in Italy. Jointly with Portugal and Germany, Italy recorded the lowest economic growth in the euro zone in the pre-crisis years from 2000 to 2007. The country was heavily affected by the crisis, particularly its Southern regions. From 2008 to 2016, the GDP declined by an annual average of 0.8%. The accumulated fall of the GDP amounted to 7.1%. Italy’s 2016 GDP has just reached the level of 2001. For the Mezzogiorno, the figures are even worse. The average decline of GDP was 1.3% per annum, the accumulated decline added up to a fall of GDP of 11.3% Industry was particularly badly affected. In the Mezzogiorno, manufacturing production fell even by staggering 28.3% between 2009 and 2014. Industrial decline has affected the banking sector as well. Italian banks had followed rather conservative and cautious lending policies. But stagnation and crisis led to increasing defaults of borrowers. The crisis has increased unemployment, particularly in the South In 2015, 34.1% of the population of the Mezzogiorno suffered from a poverty risk. Much of the youth is without any perspective. competitiveness. Against this background, Lega made the euro one of its main campaigning topics besides racist and extremely aggressive anti-migration propaganda. The critique of the euro resonates positively with small- and mediums sized exporting enterprises. The rigid German attitude regarding crisis resolution in the Southern periphery of the euro zone and the rigid budgetary rules have been criticized not only by the political (far) right, but also by left-wing forces. Beyond the euro issue, Lega advocates a mixtures of heterodox and orthodox policies. It advocated industrial policies, but also the neo-liberal flat tax. It is clearly the party of small- and medium-sized business and the self-employed. Movimento Cinque Stelle made the introduction of a “Reddito di cittadinanza”, a citizens’ income, a pillar in its campaign. This proposal found strong resonance in the South of the country with its endemic unemployment, informal employment and poverty. The proposed coalition treaty added these positions. In a way, it represented a compromise between small- and medium sized industry of the North regarding tax policies and Southern interests, especially regarding citizen income. The binding factor was a critical position vis-à-vis the euro. On that issue, the coalition treaty did not take a clear position. The proposed coalition was heterogeneous, and the present relationship between Lega and Movimento Cinque Stelle is tense. Mattarella’s refusal to accept the economic programme of the government has given a boost to Lega. Mattarella vindicated the claim of the far right that the pro-EU establishment is unwilling to accept democratic decisions. In the end, both sides partially backtracked. President Sergio Mattarella accepted a government of Movimento Cinque Stelle and Lega with Saviano as a Minister for European Affairs. The two coalition partners proposed the liberal economist Giovanni Tria as finance minister. Tria is less outspoken than Saviano, but is critical of German neo-mercantilist economic policies as well. A hot summer is ahead – both for Italy and the Eurzone.